UK, 1955, 99 minutes, Black and white. John Mills, John Gregson, Donald Sinden, James Robertson Justice, Michael Medwin, Lee Patterson, Lyndon Brook. Above Us The Waves is one of the many British tributes to the armed forces and their work in World War Two. It is interesting, has a sense of documentary, but was one of very many similar films of its time. The cast also appeared in similar films of the period. The film is directed by Ralph Thomas who made a wide range of films in the '50s and '60s including the Doctor series as well as remakes of The 39 Steps and A Tale of Two Cities. 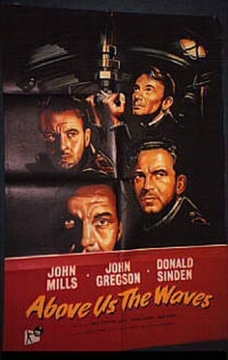 The film has a strong cast, led by John Mills. Anthony Newley, Theodore Bikel and O. E. Hasse as the Captain of the Turpitz appear in the supporting cast. A tribute to war action. A film of its time. 1. The war films from Britain in the '50s? Their re-creation of war action? Their tribute to the men involved? 2. Black and white photography, documentary style? The battle of the Atlantic, the German battleships, Norway? The training of the men? Underwater photography and action? Musical score? 3. The title and the focus on the submarine forces? Their missions, success, defeats? 4. The war situation: the battle of the Atlantic, the battleship Turpitz and its power in the Atlantic? Its hiding in Norway? The selecting of volunteers and the possibility of human torpedoes? The training, the mission, the thwarting of the mission and the storm, the escape, the second attempt, the execution of the plan, its partial success, the men on the Turpitz and the tribute to them by the German? captain? 5. The personalities involved ? staunch British types: Fraser as Commander? Duffy and his support, Corbett and his abilities? The selection of the men? Fraser and his meeting the men on the ship, his familiarity with them in action? Their loyalty to him? The training, the briefing, the first attempt, the escape, the second attempt, Fraser's decisions, Duffy's decisions, on the Turpitz, the explosions? How well did the film portray the characters? As men in war? 6. The portrait of life on the ship, the various personalities, their interaction? As expected from this kind of film? 7. The authorities: decision-making, communicating of the mission, training? 8. The portrait of the Turpitz, the captain and his reaction to the men, his tribute to their success? 9. Issues of life and death? Courage and heroism? The consequences for the winning of the war?